Concrete is an amazing medium for countertops. You know it and I know it, but one of the biggest challenges of growing a concrete countertop business is helping consumers and business owners near you to know that too. We caught up with Nathan Keida, alumnus of our Ultimate Class last year, recently and he shared some of the challenges he’s faced as he’s worked toward growing his business Stoneworks Concrete Artisans in upstate New York. Nathan is passionate about concrete. You can hear it in his voice as he talks about his latest project or growing his business. Right now he’s working concrete on the side and a regular job during the day, but he hopes to soon have the opportunity to focus all his efforts on concrete. 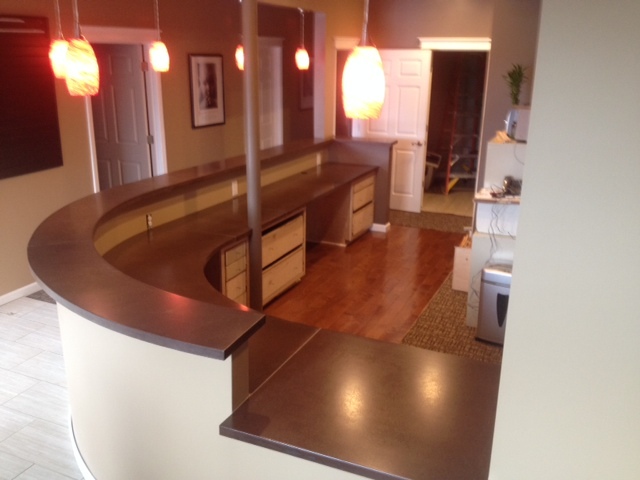 This was the first job Nathan completed, a precast reception desk for a chiropractic office. One of the primary methods Nathan uses to grow his business is word of mouth. He does jobs for friends and family and the occasional person he randomly meets. As he talks about his new found passion he’s noticed that in his area concrete countertops need quite a bit of explanation. He explains, “When I tell people I’m making concrete countertops they look at me like I’m crazy.” Although it might take a bit of explaining, he’s found that once people realize what you can do with concrete they are pretty impressed. Design-wise his area might be a bit behind, but he’s excited to help them discover concrete countertops. 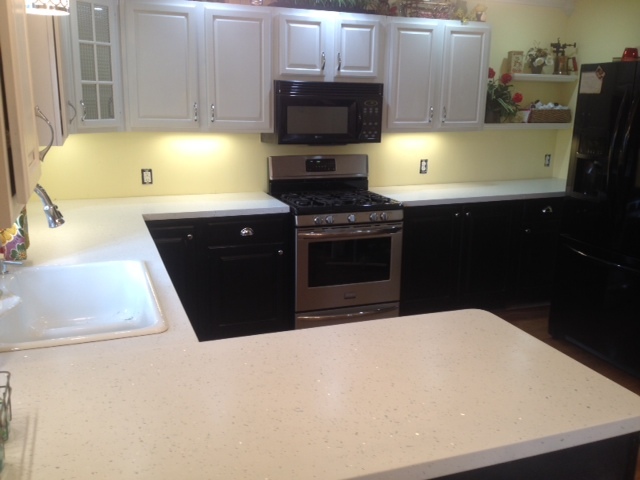 Exposed crushed mirror makes this countertop really sparkle. For the last six years Nathan’s been working in masonry, which he enjoyed, but it wasn’t until he helped his boss pour concrete countertops for his kitchen that he realized his love for concrete. When the job was complete he found himself missing concrete and he knew that he had do more with this medium. He found The Concrete Countertop Institute and signed up for classes. Before joining us for the Ultimate Class Nathan had a bit of experience with concrete, but he found the real learning started when he got home. As he worked with various mix designs and created his first few countertops the principles he learned in class started to come together. Over the last year he’s been perfecting his technique as he grows his business. 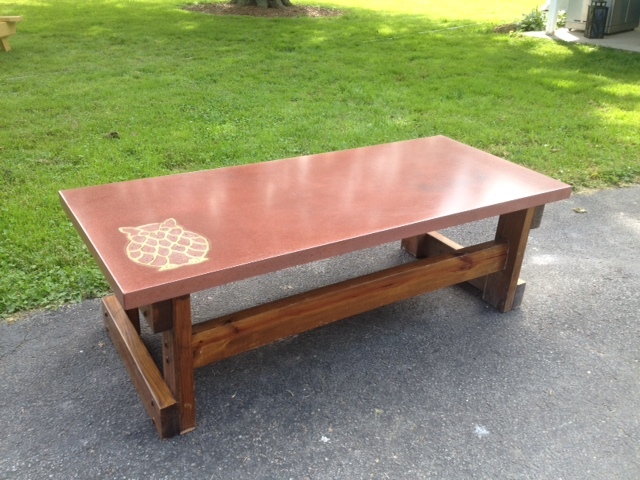 We’re loving the color on this precast coffee table with a brass owl inlay. Gorgeous work! Thank you so much Nathan for sharing your work with us. Word of mouth speaks volumes, but we’re certain that your stunning pieces will also do their part in helping you to find new customers as you focus all your efforts on concrete.